Try to guess what will be next. The San Onofre Nuclear plant is just down the beach. When I get a GTX590, I’ll jus call them up and tell them to toss some more pellets in. LOL! We’ll have to upgrade our PSU just for our GPUs. Isn’t the power limit for PCIe 2.0 w/o the aux power connectors 300W? Wrong way to about it. Even Apple learned a few things in graphics department in their choice of chipsets for the iPad2-bigger not necessarily better. Let NVidia sink their fortune along with gamers. 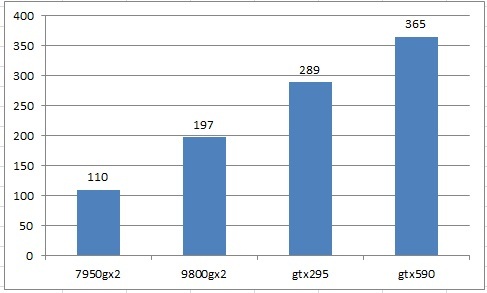 Even the video technicians find the midrange cards (GTX285, ATI5770)deliver quite acceptable performance. From here on out till the end of time, our mantra should be “less energy always”. Try ganging up 16 of those PowerVR SGX 543MP2 chips, maybe then we have a better solution. With that pattern I would say the next step would be 447W for one card, lol. LOL and that’s not even peak consumption. Hi, have anyone got 9800 GX2 work full on Snow Leopard? I have image on screen but mac cannot identify the video card to fully work with it. Please help me!